Q&A with Paul Reynolds, CEO of FableVision, Inc. When you think of fun and educational, what comes to mind? We conjure up things like games (of course! ), stories, animation, museums and more. We also can’t help but think of our friends at FableVision Studios who have been some of the best partners in the industry. In fact, we had the pleasure of working directly with the one and only Paul Reynolds, CEO, in the making of Mayan Mysteries™. We took some time to talk with Paul about what inspires him, what book he’s ready to open, and much more! 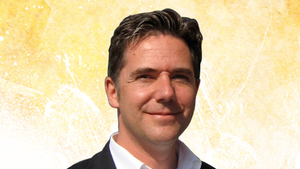 Paul Reynolds, CEO of FableVision, Inc.
Can you tell us a bit about FableVision and its mission? FableVision is an educational media development studio located on the top floor of the Boston Children’s Museum in Boston’s Innovation District. We’re on a 200-year mission to collaborate on, create, and share positive storytelling, media, and technology to help move the world to a better place. Right out of the gate, our company tagline was “Stories That Matter, Stories That Move,” and we haven’t wavered from that focus. FableVision was founded in 1996 by my business partner, the amazingly creative Gary Goldberger, along with my identical twin brother Peter H. Reynolds who is now also known around the world as a creativity champion and best-selling author/illustrator of storybooks for all ages including The Dot, Ish, Sky Color, The North Star, and dozens of other titles. So storytelling is and has always been one of the critical tools in our media toolbox. Today, FableVision is proud to have an award-winning team of animators, coders, writers, developers, designers, and producers who create a wide range of media – including online games, mobile apps, animated films, interactives, websites, and media-rich software applications. Our creative partners include publishers, museums, nonprofits, and broadcasters – including best-in-class organizations such as PBS Kids, Jim Henson Company, Classroom, Inc., Scholastic, Lulu Jr., McGraw-Hill, Smithsonian, National Geographic Society, and Dig-It! Games, of course. What do you enjoy most about working in the educational space? What could be better than dedicating one’s life to helping foster creative human potential? We love collaborating with other kindred spirits who understand the power of media, gaming, storytelling, and constructionist uses of technology. We have a great network of fellow developers, researchers, and creative educators who are helping usher in one of the most exciting moments in the history of human learning – accelerated by global connectivity that is helping transfer innovation across the learning network like wildfire. -Ellen Langer’s mindful learning approach (establish personal relevance and meaning to engage learners, not mindless memorization). -Jean Piaget’s Cognitive Constructivism (constructing mental models to learn). -Seymour Papert’s Social Constructionism (socially co-constructing real projects to make the cognitive tangible). -Chuck Dwyer’s concept of “learning as self-design” (if we can imagine our future, more actualized selves, how can we design ourselves to realize that vision). -James Paul Gee’s work around the “regime of competency” in gaming and learning (the notion that effective gaming can throttle an experience between too easy/boring and too hard/time to give up – and keeps the learner fully engaged until they reach each level of mastery with no “game over” penalty) and advance to the next level when they are ready. -Jean Piaget’s quote “Play is the work of children.” Playful learning or “hard fun” is how we are wired as human beings to understand the world from our earliest years. When we stop taking the play out of learning, we’ve not only robbed the joy from education, but tripped up one of our innate mechanisms for making sense of our world. -Jerome Bruner’s theories about self-concept and learning (human beings live into stories and experience transference and personal transformation). Peter and I recently had the pleasure of meeting Dr. Bruner at his home in New York City. At 99, he’s still going strong. It was such an honor to meet a kindred spirit who understands the power of narrative and storytelling to aid in self-design and learning. We gladly carry that torch forward. FableVision Studios partnered with Dig-It! 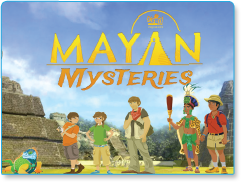 Games™ to create multiple games, including the award-winning Mayan Mysteries™. Can you tell us what aspects of these games you feel have the biggest impact in the classroom? Social studies has been sidelined by a recent obsession with science and math. While STEM is definitely a critical area for studies and careers, there just hasn’t been the same investment in learning resources required to raise thoughtful global citizens in the 21st century on a planet that needs cooperation and collaboration for its survival. Dig-It! Games™ provides an exciting new doorway into social studies that leverages game theory and design to get learners engaged in personally transformational ways. Teachers can leverage a student’s personal connection to the material – which includes math, science, and language arts, so there is a richness in the learning experience that goes far beyond standard lecture and reading that can easily dispirit learners. It’s National Reading Month! What’s on your coffee table or night stand at home? I have a book on my bedside that I have to start reading called Strong Boy by Chris Klein. The biographical novel is part of a town-wide read we’re doing in my hometown of Dedham, just outside Boston. It’s the story of Boston’s own James L. Sullivan, the first modern heavyweight boxing champion in the late 1880s, who also instantly became the first celebrity sports figure to earn over a million dollars. It’ll make a great movie someday – which must include the 75-round bout against fellow Irish-American Jake Kilrain. What advice would you give to a young student who is interested in getting involved with digital game development? Get your hands on kid-friendly programming software like Scratch from MIT Media Lab. My son, Ben, cut his teeth on game coding with this free, online programming language when he was in middle school to create his own interactive stories, games, and animations. What are your top three tips for teachers looking to bring games into the classroom? First, network with colleagues to find games that have been successful in the classroom and share best practices around applications. There are apps such as Lure of the Labyrinth online math game, which FableVision produced with Learning Games Network for Maryland Public Television. It was co-designed with teachers for the classroom – with years of use and success. Definitely worth checking out. Second, if possible, play WITH your students – let them see that you are as immersed in the experience as they are. It shouldn’t feel like an assignment – but more like group play that provides for the best kind of organic distributed learning. Third, ask your students for recommendations and feedback. Giving them agency in scouring potential learning games helps build their digital literacy skills. That creative prompt will help them develop into mindful gamers.